High above Estes Park on Trail Ridge road, nearly 12,000 ft above sea level is the Rock Cut. 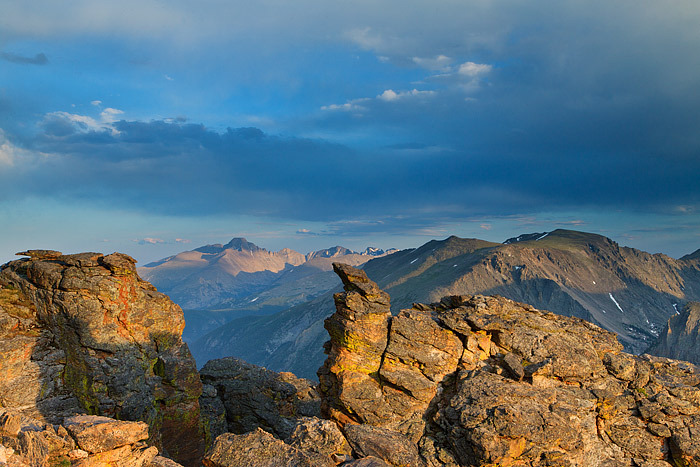 The Rock Cut gives one some of the most thrilling views of Rocky Mountain National Park highest peak, Longs Peak. The Rock Cut also gives visitors a look down Forest Canyon and across the valley to the Gorge Lakes area of Rocky Mountain. The Rock Cut is also a favorite location for photographers seeking to capture dynamic images of Longs Peak and Rocky Mountain National Park. In this view from the Rock Cut, the late after soon is viewed poking through the clouds and bathing Longs Peak in soft dappled lighting. Photo © copyright by Thomas Mangan.